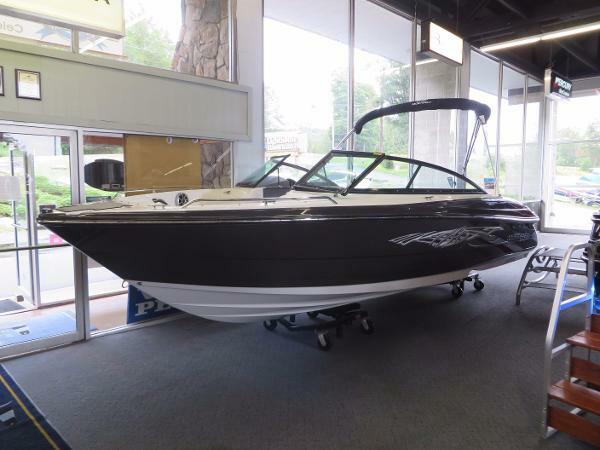 2016 Monterey 196MS This brand new 2016 Monterey 196 MS is powered by a 4.3 L Merc Alpha 190 horsepower engine and has a Titanium Grey hull with an Arctic Ice bottom and Montura graphics.Pull-up cleats, black urethane grab handles with SS inserts, and bow rails are included in the stainless steel package on this beautiful 196 MS. Also featuring a full stand up bimini top with embroidered boot, bow and cockpit covers, and a convenience package, this boat is a must see! 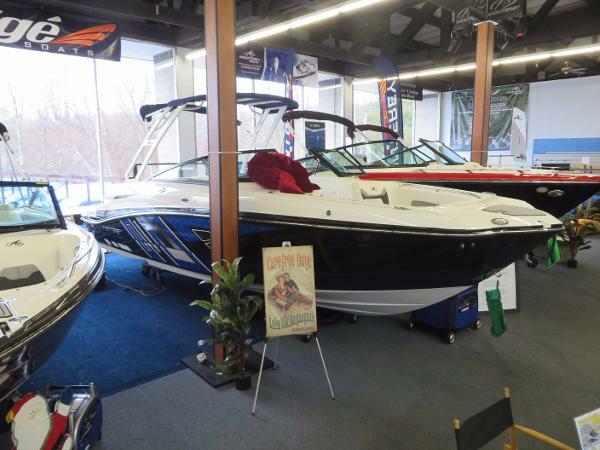 The new arena cockpit seating configuration is also displayed in this boat for maximum seating options.Please contact us for more information or stop by our lakefront showroom today to see everything this 2016 196 MS and Lighthouse Harbor Marina has to offer you and your family. 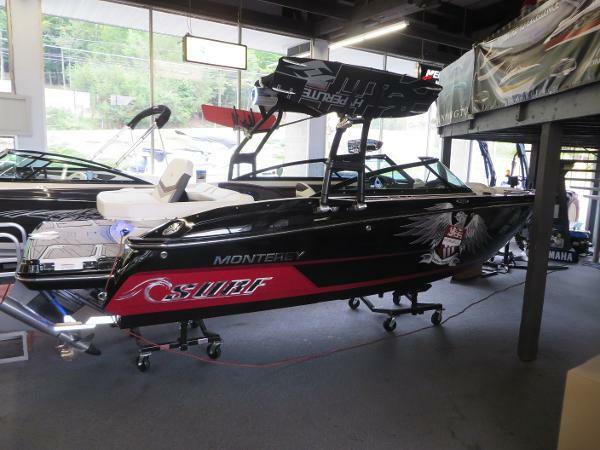 2016 Monterey 224FS Here is the redesigned 2016 Monterey 224 FS Bowrider! Powering this boat is the brand new Mercruiser 4.5L 250 h.p. Cat Motor. This boat is Titanium Grey with Onyx Black Canvas. 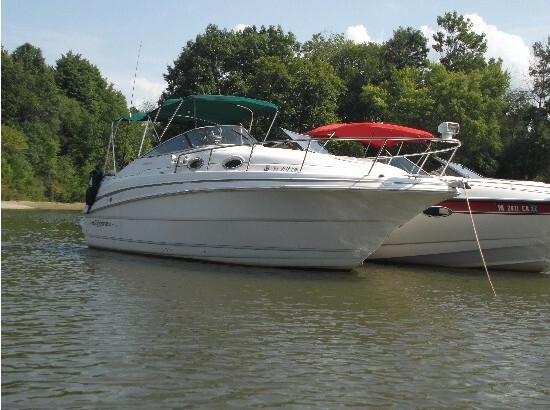 Other options in this 224 include the new Arena Cockpit Seating Configuration, Seadeck Flooring Inlay throughout the entire boat, Fusion Stereo remotes at both the Helm and Stern, Stereo Upgrade package with Amp and L.E.D. lighted Wet Sounds Premium Speakers, Bow and Cockpit Covers in Onyx Black, Interior Upholstery Accents in Anthracite Grey, Monterey Extreme Graphics, Raymarine GPS Chartplotter in Dash, Battery Charger with Deckplug and Full Bimini Top.Please contact us for more information or to schedule a time to come in and see all this Monterey Sportboat and Lighthouse Harbor Marina has to offer you and your family. 2016 Monterey M6 Here we go! This is the new 2016 Monterey M6 Sport Boat. This boat is Sapphire Blue and Arctic Ice with Onyx Black Accents and the new M-Series Graphics Package. Powering this 26 foot Bowrider is Mercruiser's new 6.2L Big Block V8 producing 350 h.p. and turning the Bravo III dual props.Options in this M6 include the Arctic White Reverse Tower with Full Bimini, Electronic Engine Hatch Lift, Head Compartment with Pump Out Fitting and Sink, Raymarine GPS Chartplotter with Sonar, Stainless Steel Appearance Package with Pop Up Cleats, Bow Rails and Bow Ladder, L.E.D. Docking Lights, Huge In Floor Storage Locker, Rear Facing Spotter Seat for Tow Sports, Integrated Cockpit Cooler, Power Folding Aft Seat, Rear Trunk Storage, Stern Fresh Water Washdown, Transom Tilt Switch, Seadek Flooring throughout entire boat, Dual Batteries with Switch, Battery Charger with Deck Plug, Port Side Forward/Aft Facing Lounger, Cockpit Table and Much More!Please contact our Marina for additional information, or to set an appointment to come in and see all that this Monterey Sport Boat and Lighthouse Harbor Marina has to offer you and your family! 2007 Monterey 194FS Montura Monterey 194. Includes tandem trailer. 130 hours. 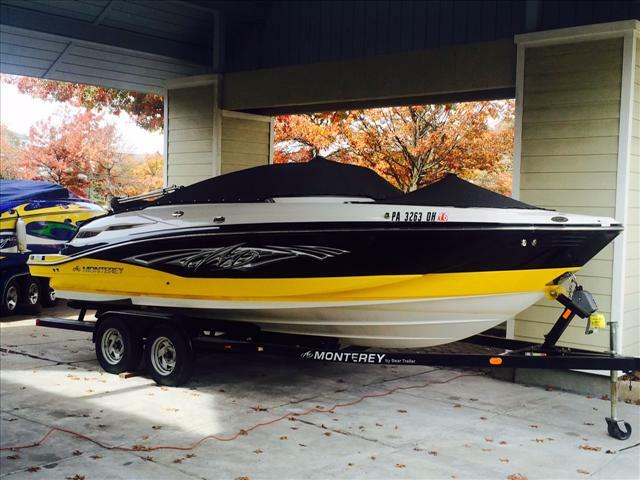 2016 Monterey 264FS. Rigged with a Mercruser 6.2L 300 HP BR3. Includes the following: Havana Upholstery and Graphics Onyx Canvas Docking Lights Port light Inboard Head Wall Sea Dek Swim Platform Inlay Bow and Cockpit Cover Sea Dek Cockpit Inlay Pump Out Deck Fitting for Toilet Battery Charger w/ Deck Plug Spacious and Agile The 264FS features an agile frame that comfortably and safely provides room for your entire crew. Dual bucket seats with flip-up bolsters swivel to face the rear L-shaped lounge, which also doubles as a sun pad. The spacious adult-sized bow section on the FS also provides seat storage and drink holders in the gunwale. The ergonomically designed helm station features full instrumentation with low-glare night lighting. The sleek appearance is highlighted by fog resistant gauges, backlit weatherproof switches, and a sleek Black steering wheel with a Silver insert. A full fiberglass head and a large swim platform with telescopic recessed boarding ladder make for safe and comfortable family outings. 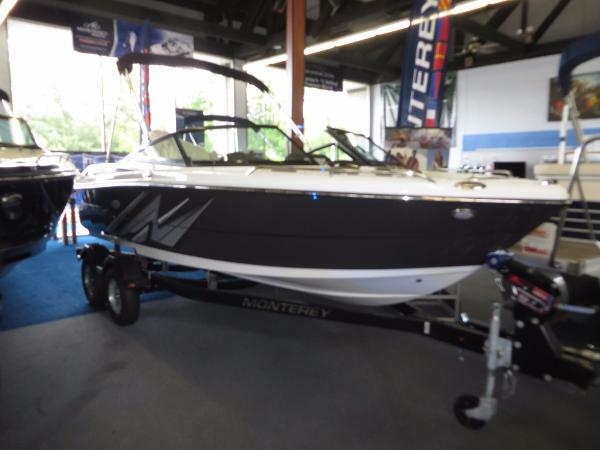 - 2016 Monterey 264FS. 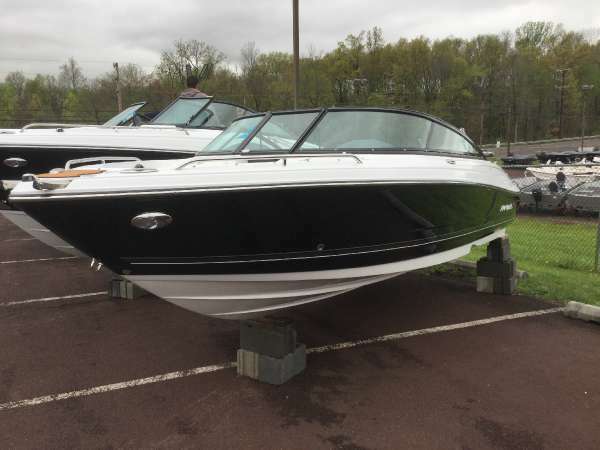 Mercruiser 6.2L 300 HP BR3. Onboard Head. Cockpit inlay and More! 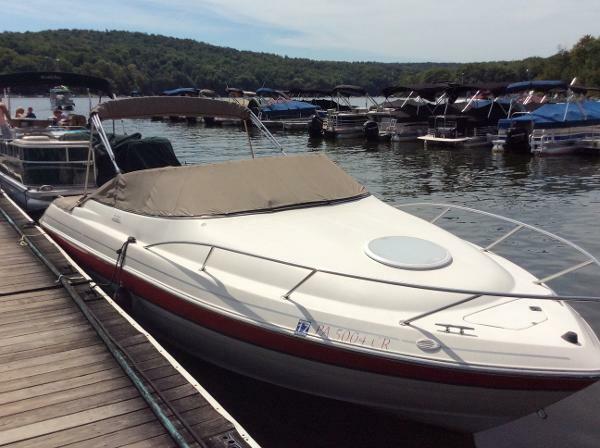 1999 Monterey 236 Montura Nice well maintained boat. We have serviced and stored this boat since 2003. It has been used on our freshwater lake for that long or longer. 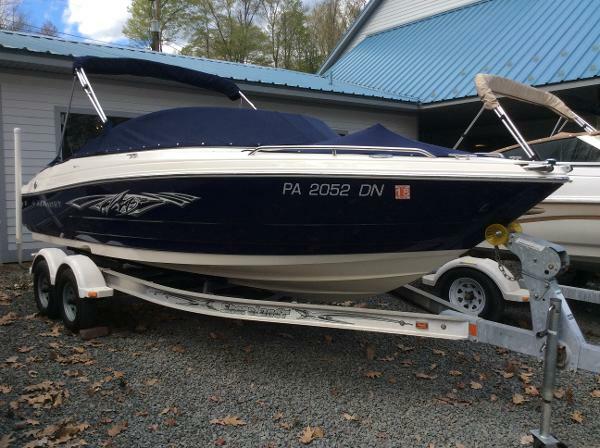 It has a 350 mercruiser 5.7l fuel I jected engine. Boat is bottom painted and has no trailer. 2005 Monterey 223 Explorer Sport Cover, Tower, Volvo 5.7 Liter, Tandem Axle Trailer, Dual Swim Ladders, Consignment Get away from it all, or take it all with you. With Monterey's versatile 223 Explorer Sport it's your choice. The unique hybrid design makes a dramatic visual statement. And there's comfortable seating for a boatload of friends. 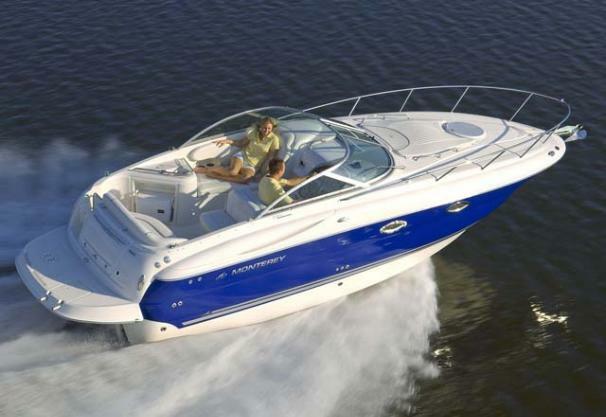 Walk-thru windshield leads to private, enclosed head, a spacious bow with lounge seating and plenty of hidden storage. Open cockpit features tempting convertible Sun Island and wet bar. 2016 Monterey 204FS 2016 Monterey 204 FS. Rigged with a Mercruiser 4.5L 200 HP.Upgrades include: Anthracite Fabric Interior Onyx Canvas SS Package Dea Dek Swim Platform Inlay Bow and Cockpit Covers Depth Sounder Stereo Remote, Helm and Stern Transom Tilt Switch Performance and Style Show off the uncompromising performance and elegant style of the 204FS Sport Boat. Standard features include stainless steel cup holders, power and tilt steering, extended swim platform with telescoping and recessed swim ladder, integral swim platform with ski rope storage and plenty of bow area seating and storage. The Facet Series design and handling of the Air Assist Chine combine to make the 204FS a powerful and chic performance machine sure to make those around you envious. - 2016 Monterey 204FS. 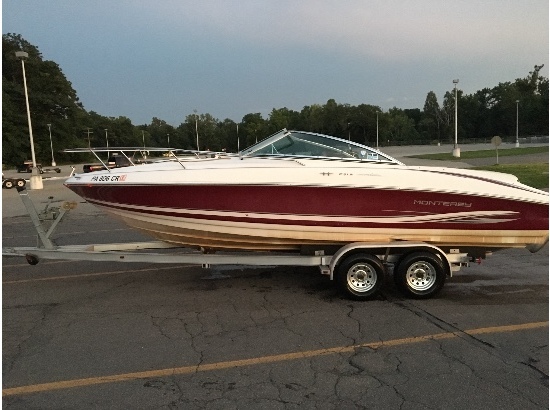 Mercruiser 4.5L 200HP. Depth Sounder. Sea Dek Inlay. Stereo Remote and More! 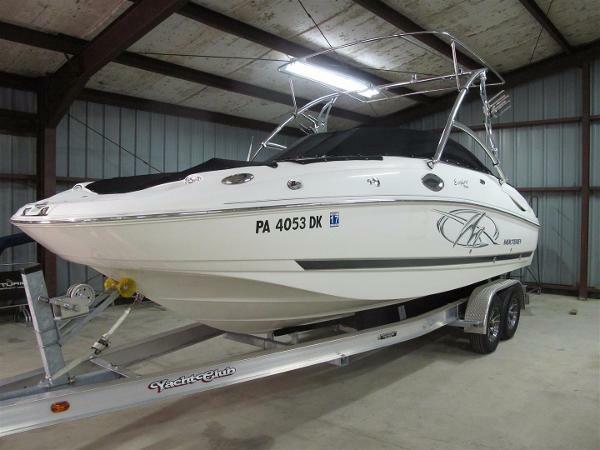 2011 Monterey M Series M3, 2011 Monterey M3 is equipped with: Upgraded sound system, 350 Mag Mercrusier (300 HP), Bravo III outdrive, GPS/ Fish Finder, Head, and tandem trailer. 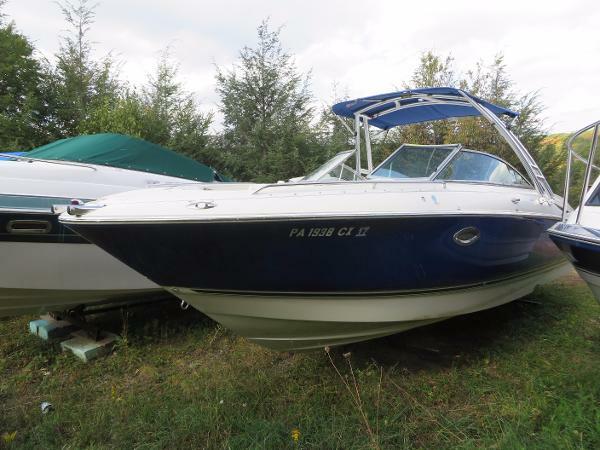 This boat is priced to sell! 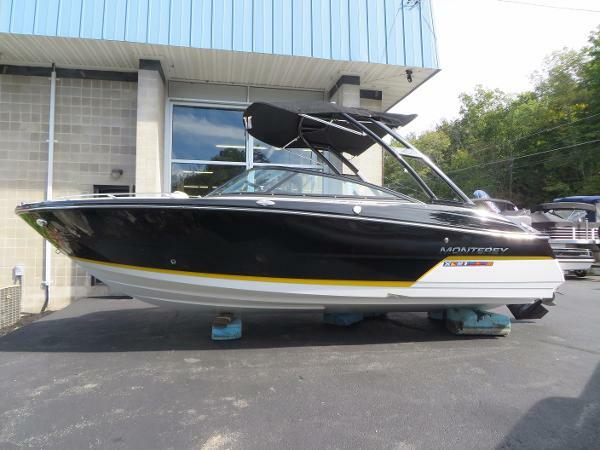 2006 Monterey 248 LS Now available is this late model Monterey 248 LS Bowrider with Wakeboard Tower. This boat is Sapphire Blue with Blue Bow and Cockpit Covers. Powering this Monterey is a Volvo Penta 5.7L GXI with Duoprops. Hours on this Unit are 162.Other options in this boat include a full Head Compartment with Pumpout, Kenwood Sound System, Wetbar with Console, Depth Sounder, Cockpit Table, Dual Batteries with Switch and Snap-in Cockpit Carpeting.This boat was purchase New from our Lakefront Marina and we have looked after it since new. 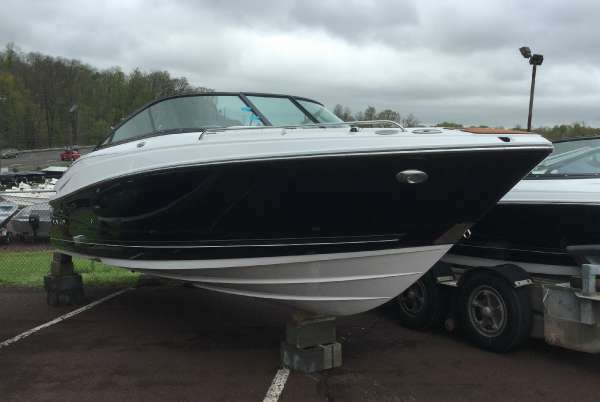 Please contact us for more information or to schedule an appointment to come and see this boat in person.